Neil Armstrong on the Apollo 11 Mission, 20 July 1969. Image Source: Time. 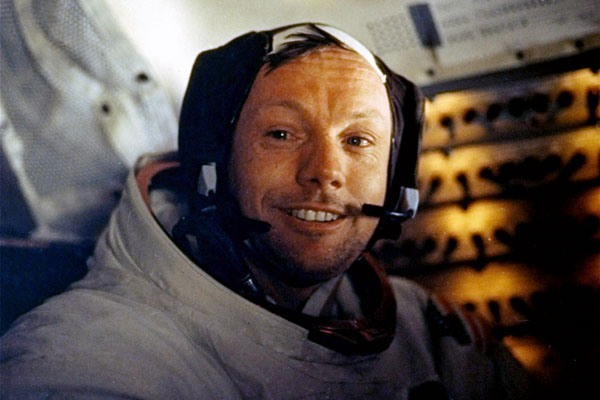 Neil Armstrong, first man to walk on the moon, during the Apollo 11 mission, has died at the age of 82. He stepped on the moon "at 2:56 UTC July 21, 1969, then spoke the famous words 'That's one small step for man, one giant leap for mankind.'" Farewell Sir, walk among the stars. I think Neil Armstrong proved something important, especially for today's jaded, data-saturated world where judgement over relative good and bad have been eaten away. That is, he proved that the impossible was possible to achieve in a good, patient and sane way. Those who doubt the moon landings (based on questions of why the USA did not go back to the moon) should look at policy focus on the ISS, combined with domestic political priorities of the Boomer era. They should not diminish this great Apollo 11 accomplishment by foisting their brewing doubts about reality on it.